The British pound continues to be vulnerable to the ongoing Brexit drama and is down 0.35% against the USD as we move into the North American session. The UK PM is expected to seek an extension to the exit date, hoping to present a better plan to the House of Commons. 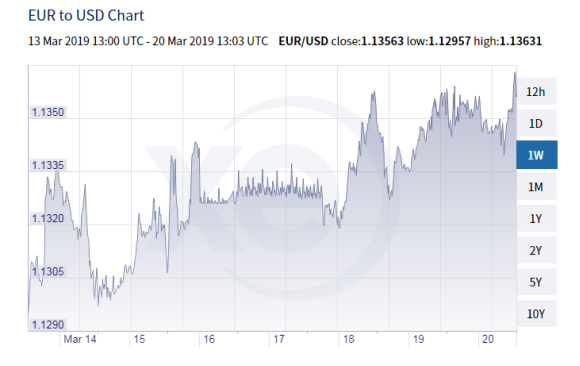 GBP/USD is trading with a negative sentiment as investors are growing increasingly impatient with the recent Brexit developments. The PM hopes to have the opportunity to quickly draft a new Withdrawal Plan, and she has reportedly rejected the idea of having a long extension to Article 50. Businesses are hoping for more clarity. Meanwhile, inflation for the past 12-month edged higher to 1.9% in February, up from 1.8% in the previous month. The pound remains highly vulnerable to ongoing political stress over Brexit and Fed decisions.